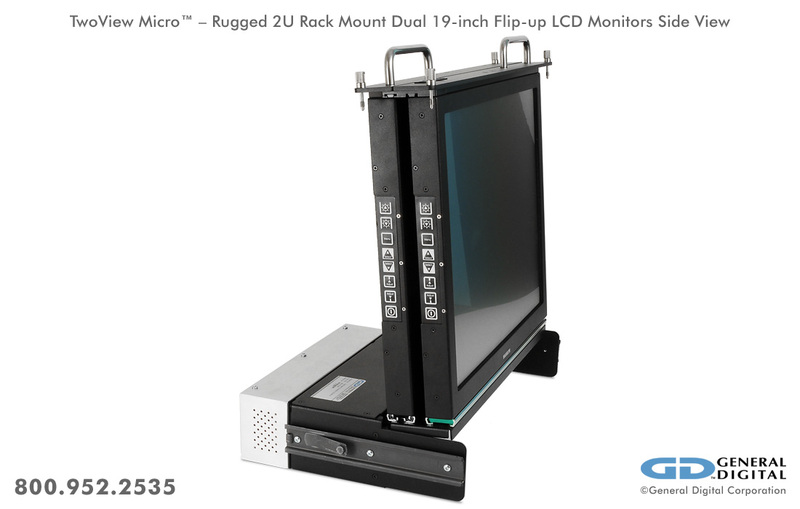 Optimized for its low profile (3.50" high), the TwoView Micro is designed to save valuable space while increasing your video content capacity via two displays in an area normally reserved for one. Using the supplied mounting brackets, the TwoView Micro can be easily secured to horizontal (ceiling, rack) or vertical (wall) surfaces. 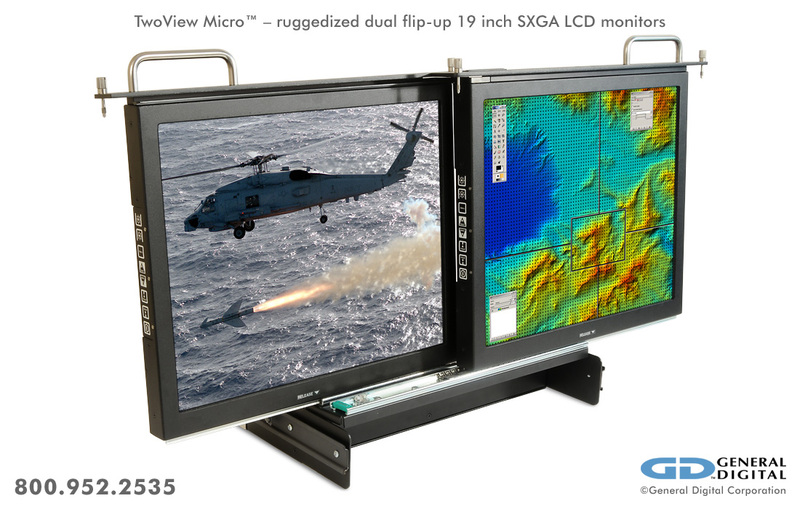 The TwoView Micro’s compact design and industrial durability, combined with General Digital’s legendary configuration control and long product life cycles, make it the ideal display solution for network administration, telecommunications, mobile (transit case), tactical in-vehicle applications and more. 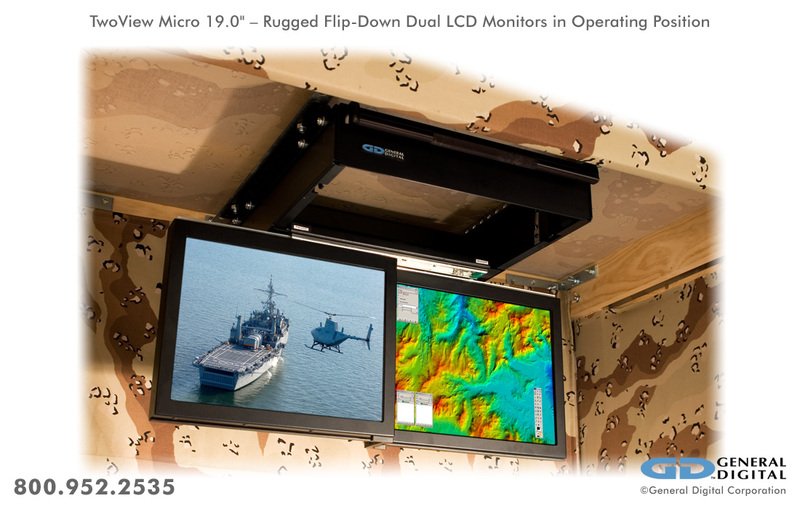 We work with you to configure and build your TwoView Micro monitor to meet your precise needs. Furthermore, we offer a wide range of practical options for you to custom design your unit. 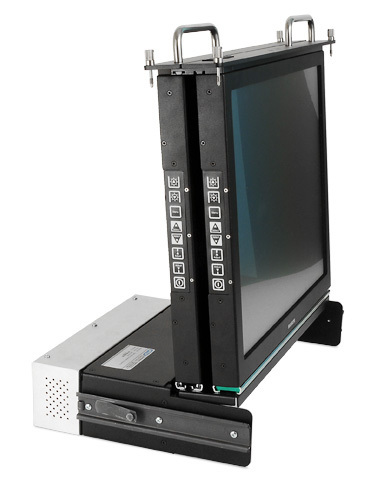 Configuration flexibility with a wide variety of LCDs, video controllers, display overlays, power supplies, slides and enclosures to meet specific requirements. The TwoView Micro’s rugged aluminum enclosure is designed to withstand the rigors of commercial, industrial and military environments alike. It has an iridite coating (conductive anodized), which provides protection from corrosion and improves shielding properties where metal parts make contact with one another. All external surfaces are finished with a durable black powder coat. 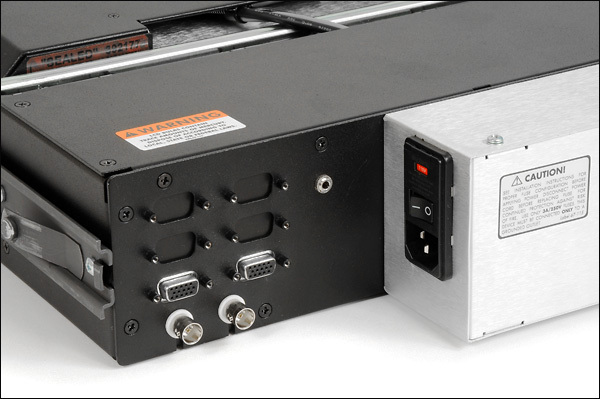 The 2U high (3.50") rack mount enclosure of the TwoView Micro is constructed from a combination of steel and aluminum, providing a cost-effective, lightweight housing that can be used in most commercial and industrial applications. In addition to rack mounting, the TwoView Micro can be mounted to a ceiling or wall (it can be factory-configured to flip up or flip down). Use of continuous-friction hinges permit the display to be user adjusted over a usable range of more than 90°. Display retention latches are used to secure the displays while they are stowed to minimize vertical “chatter” when subjected to shock and vibration. 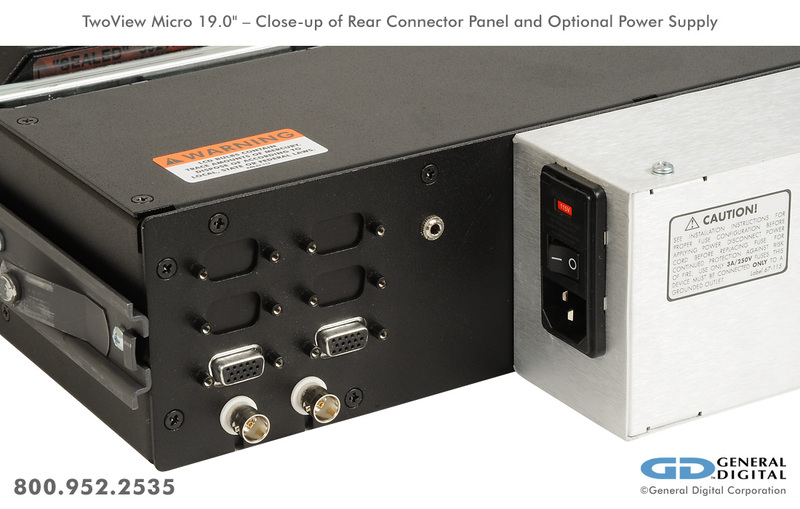 The TwoView Micro’s enclosure is built to survive demanding environments such as factory floor, food processing, medical and military (MIL-STD-901D, MIL-STD-810F) applications. 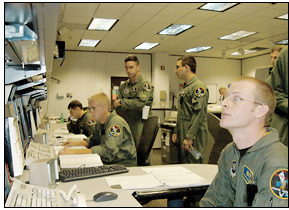 Overall, this assembly technique permits General Digital to offer a high performance product, at a moderate cost, with flexible design options. Watertight gaskets are installed between the LCD (or overlay) and the front bezel to prevent liquids from entering the enclosure through the display opening. 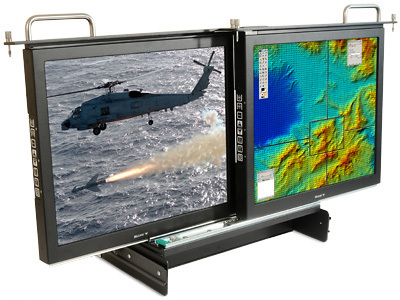 Dust gaskets are often supplied for monitors that do not require a liquid-tight seal between the display and/or overlay and the bezel, or for systems that use a touch technology that are only compatible with certain gasket types. By default, the TwoView Micro is configured to operate from an integrated (or externally attached) AC switching power supply. Optionally, a separate +12 Vdc or +24 Vdc supply is available. Our active matrix TFT LCD panels offer up to 16.7 million colors, wide viewing angles and fast response times (which is ideal for high definition live video). If our stock offering does not suit your needs in terms of size, fit or function, please contact a Sales Engineer, who will work with you to configure a system to meet your specifications. All standard TwoView Micro units support interlaced and non-interlaced analog video (separate, composite, Sync-on-Green). Support for STANAG 3350 A, B and C analog SoG video is also included as a standard feature. 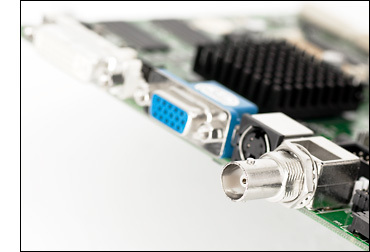 To accommodate the latest video standards, the TwoView Micro can be factory-configured (optionally) to support analog, digital, integrated video (DVI-A, DVI-D, DVI-I); high definition multimedia interface video (HDMI); and high definition and standard serial digital interface video (HD-SDI, SD-SDI); fiber optic video signal extension via fiber optic to DVI conversion. The TwoView Micro can be optionally configured to support NTSC, PAL, RS-170 and SECAM video in composite video or S-video format. Also supported are high definition multimedia interface video (HDMI), and high definition and standard serial digital interface video (HD-SDI, SD-SDI). The fast response times of our active matrix TFTs make them ideal platforms for live video input. Below is an overview of typical General Digital TwoView Micro Series model numbers. Having a good understanding of the structure of our model numbers will help you configure your monitor. The TwoView Micro enclosures have been carefully designed to allow our design engineers to modify/customize the existing designs to accommodate a variety of display size/resolution combinations. Customers greatly benefit since they can request virtually any OEM LCD of their choice for integration, or select from an evolving list of value-added GenFlective, Sunlight/High Brightness or NVIS-Compatible enhanced LCDs. Below are listed the most popular video controllers for use with the TwoView Micro Series. Please inquire with a Sales Engineer for more information. 15.0" 3.50" (2U) x 15.55" x 19.50"
17.0" 3.50" (2U) x 17.00" x 22.00"
17.3" 3.50" (2U) x 17.00" x 22.00"
19.0" 3.50" (2U) x 17.00" x 22.00"
The TwoView Micro Series is highly configurable. There are many overlays that can be added in front of or behind the LCD to improve its performance. Please speak with a Sales Engineer to select the right overlay for your budget and performance requirements. Note that a unique numerical identifier will be assigned depending on the specific overlay(s) selected. Download our full list of assigned overlays available. 1 Since the TwoView Micro Series does not include an embedded power supply as standard equipment, we strongly recommend the purchase of a General Digital-manufactured power supply, which is specially designed and tested to work with our LCD monitors. Please note that these supplies include the required DC harness and connector to interface to your TwoView Micro unit. 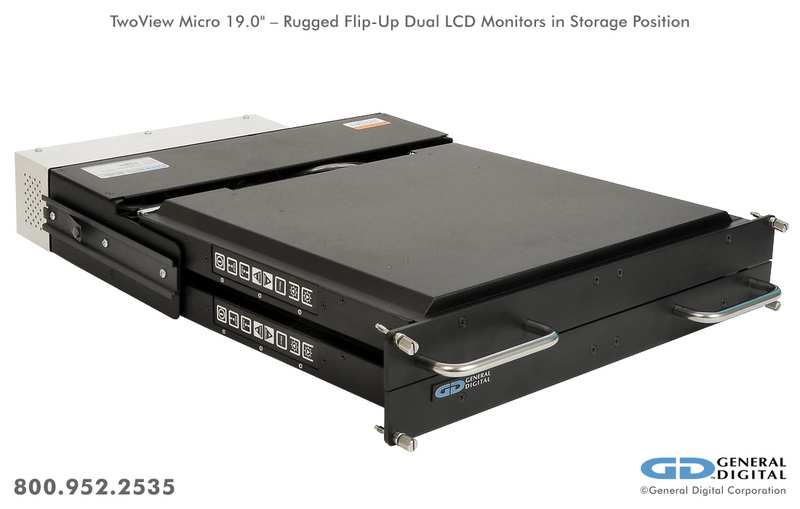 The photos below represent a small sampling of General Digital’s standard and custom TwoView Micro dual LCD products. They serve to illustrate the many display sizes and mechanical configurations we offer, as well as standard and custom design features, capabilities and options. Click the thumbnails to view full-size photos. Watch the videos below to learn more about our TwoView Micro and other flip-up monitors, and display services General Digital offers for most monitors, whether built by us or another manufacturer.